Because my schedule is mostly filled with architectural, furniture and specialty woodturing, I don't get much time to do artistic work anymore. However, if you've got a beautiful burl from that tree that your great-great-great grandma washed clothes under, I might be able to make you a nice salad bowl from it. Or, I'll put you in contact with one of my woodturning-pals. 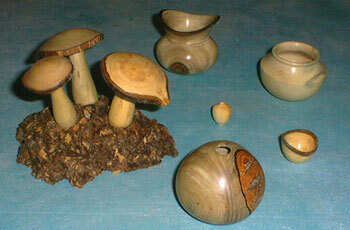 One item that I especially enjoy turning is natural edge mushrooms. These are turned from green (fresh-cut) branches, around 3 inches in diameter. Sometimes, I assemble collections on burls as shown in the photograph, which makes for a nice, natural-looking sculpture.